Whether you are looking for a new Church home or just curious, we want you to know that God loves you and in his Most Holy Name we welcome you to join us in worship and learn more about our Church and the Faith we hold. At St. Stephen's, you will find "the faith once delivered to the Saints"-a faith proclaimed, believed, and lived. That faith revealed in the Bible, summarized in the Apostles and Nicene Creeds, and taught by the early Church and the Seven Ecumenical Councils. 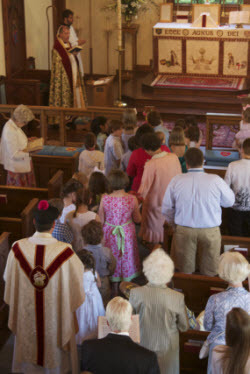 We offer you a timeless and vibrant faith, beautiful liturgy, traditional music, sound theological and Biblical preaching, and a loving and welcoming community of believers. Want to know more? Please check out the rest of this site for information on our beliefs and parish life. You may also contact me directly at the church office or by email at revfrnick@gmail.com. It will be my pleasure to tell you more about St. Stephen's.